It seems that Google and ASUS have created a big hit with the Nexus 7 tablet with online retailers in the UK reporting stock shortages since it's launch. 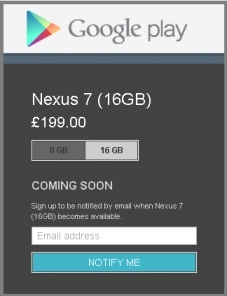 Even the official Google Play website currently only shows 'Coming Soon' for the Nexus 7 16GB version with the option to register for an email when it becomes available to purchase again. The less popular 8GB verson shows a 'Delivered in 3-5 business days' timescale. Meanwhile Argos are taking orders with an expected delivery date of 30th July whilst eBuyer have an expected delivery of 10th August. It has been reported that Google underestimated the popularity of the 16GB model and produced more 8GB models presuming that people would prefer the cheaper tablet with the promise of extra cloud storage. The picture is much the same in United States with stock shortages throughout. It's all relatively good news for Google to see its Android tablet doing so well in a iPad dominated market. The Apple rumour mill is still suggesting a mini version of the ipad similar in size to the Nexus 7 will be launched soon, however Google have now got a significant head start in this market to help them compete.